Thread Lift is a procedure which involves elevating different parts of the face using special threads without having to make surgical incisions as with a classic face lift. Thread Lift may be marketed under a variety of names including, APTOS®Thread Lift, Contour Lift, Silk Lift™, Feather Lift™ etc. There are two main types of threads or sutures used: Free floating cogged or barbed threads which do not need to be suspended in order to hold the lift; and smooth or suspension threads which need to be anchored to a stable structure of the face or scalp. This procedure is best suited to patients with mild to moderate sagging of facial tissues, usually those in their mid-thirties to fifties. Thread Lift is usually performed using a local anaesthetic. Recovery is generally quick. Private costs for a thread lift vary depending on the area(s) being treated and can start from approximately £1,500 for one area. We would like to thank Dr Lucy Glancey for her expert medical help. The use of 24 karat gold threads for skin rejuvenation is also marketed as gold filament rejuvenation. Brands of gold threads used in the UK, include SkinGold and GoldThread. Silhouette Soft is marketed as a ‘non-surgical face lift’, a ‘one-stitch face lift’ or ‘puppet face lift’, the treatment is based on suture suspension with cones which are used in both reconstructive surgery and cosmetic surgery. As we age, the effects of gravity become more noticeable on our faces. The supporting tissue of the cheeks weakens and starts to sag, facial fat is lost, the jaw line that used to be firm and tight forms jowls at the edges of the mouth that drift down towards the chin, and the lower face and neck sags. This sagging or drooping action of the tissue is referred to by doctors as ptosis, (pronounced toe-sis). 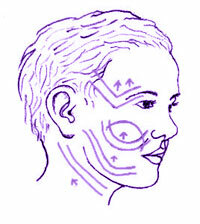 Traditionally, this tendency for one’s face to start to go “south” would lead most people to a cosmetic surgeon in search of a facelift; however, there is now a less invasive procedure available which can lift, contour and suspend the sagging tissues of the face and neck; in those people who need only little to moderate rejuvenation. Thread face lifting is a procedure which involves elevating different parts of the face and body using special threads without having to make surgical incisions as per the classical face lift, and is considered by some to be one of the most significant advances in the history of facial rejuvenation. At first, in an effort to smooth out wrinkles, European surgeons placed gold threads into the soft tissue of the face in a basket weave pattern. Unfortunately, this did not work well to start with, although significant progress in technique has now been made and this treatment is still available at some clinics in the UK. Gold wires or threads consist of a surgical suture made from 24 carat gold which are introduced into the skin with a needle, now in a mesh or fan like pattern, which allows new collagen to form around it and tighten the surrounding area. It is said that the closer the threads are placed in the 'mesh' or 'fan' the tighter the achievable lift. Dr Marlen A. Salamanidze, a Moscow cosmetic surgeon, thought that if you took prolene (a plastic non-absorbable suture) and cut barbs (very small “teeth”) along its length, it could act as a truss to hold up a drooping brow, cheek or jowl; and this resulted in the development and creation of APTOS® (anti-ptosis) threads in the late 1990’s. These barbed threads have now been patented, and further developed. Other forms of threads or sutures, both barbed and smooth have also now been developed for use in thread face lift procedures. You will find the procedure marketed under a variety of names including, APTOS®Thread Lift, Contour Lift, Thread Lift™, Silk Lift™, Russian Lift, Feather Lift™, Scarless Suture Lifting, Suture Suspension Face Lift, Curl Lift etc. If you're considering having a thread face lift, the following information will give you a basic understanding of the procedure. It can't answer all your questions, since a lot depends on the individual patient and the surgeon. Please ask your surgeon about anything you don't understand. What are the different types of Thread Lift? Free floating cogged or barbed threads do not need to be suspended in order to hold the lift; they are actually self-supporting, just like hold-up stockings. Convergent or divergent threads, depending on whether the cogs are orientated towards each other or in opposite directions from each other from the middle. Uni-directional or bi-directional threads, depending on whether the cogs are orientated in only one direction, or in opposite directions. This type of suture has become commonly known under the trade name “APTOS® Thread Lift” because, as mentioned above, they were the very first cogged thread to be developed. APTOS® threads are made of a non-absorbable monofilament material (a single strand of fibre) called polypropylene, which has been used for surgical sutures (stitches) for many years. They are designed with bi-directional cogs or barbs that go outwards from the middle of the thread and point inwards towards the middle (convergent), so that as they are inserted under the skin the cogs anchor and hold the lift. There are other brands of barbed sutures available with the differing characteristics described above. In order to achieve a lift with a smooth thread it does need to be anchored to a stable structure of the face or scalp, i.e. it needs to be suspended, just like a stocking that needs a suspender belt. They are just ordinary resorbable or non-resorbable threads, usually made from prolene or nylon, as used for suturing (stitches) in operations. How does a Thread Lift work and what can it treat? A thread lift can help lift the face without invasive surgery – inserting threads through small punctures to the skin which later become invisible - and can be used anywhere on the face where a gentle lifting is desired. This procedure is best suited to patients with mild to moderate sagging of facial tissues, usually those in their mid-thirties to fifties. The areas which can be treated with a thread lift include the outer brow, the cheeks, for sagging in the main cheek, naso-labial (nose to mouth) and lower eye areas, the jaw line for jowls, and the neck for sagging skin that is sometimes referred to as “chicken neck”. Most patients will not need all these areas treated at once, although this is possible. The threads leave virtually no scars, are simple to insert, and have minimal down time. What happens during a Thread Lift operation? Your first discussion with a surgeon should set out what you expect from a thread lift and how you would like to look afterwards. Careful discussions regarding the reasons for wanting a thread lift and your suitability for this type of surgery are very important at this stage. Make sure that you obtain as much information as is possible to help you to make a fully informed choice. The sagging of tissue of your face is then carefully assessed by your surgeon to determine which areas of your face and/or neck are to be treated. It may be that a thread lift is not the most suitable procedure for you, or that you may need further cosmetic help in addition to the threads in order to achieve the results that you desire. A medical history should also be taken, to ensure that there are no reasons why you shouldn’t have this procedure. You would normally be asked to sign a consent form at this time which means that you have understood the potential benefits and risks associated with a thread lift. The surgeon may also wish to write to your G.P. giving details of the procedure, so that if there are any problems associated with it in the short or long-term, your doctor is aware of the procedure and can help you to recover. Photographs may also be taken by the practitioner, as a “before and after” comparison at a later date. You will most likely be marked with a special pen prior to the treatment, whilst standing up (to get the full effects of gravity), and the pre-operative photographs taken both without the markings and with, in order to facilitate a retrieval of the threads in case that became necessary in the future. This procedure is usually performed using a local anaesthetic, and you may also be given sedation via an intravenous drip to make you drowsy, so that you remain awake but feel very little discomfort during the operation. Implantation and positioning of the threads is quick and takes approximately 30 minutes to 2 hours depending on the number of areas being treated and the type of threads used. Using a hollow guiding needle, such as a spinal needle, the barbed threads are inserted into the subcutaneous fat under the skin, through the small incision points made by the needle, which are about 1-2 millimetres in size, and along the contours that were previously marked on your face by your surgeon. The needle containing the thread is then positioned to provide the required correction and removed. The microscopic cogs on the threads then attach to the underside of the skin and gently lift the skin and secure it in the desired position. The excess thread is trimmed so it does not appear above the skin surface. The number of threads required is dependent on the number of areas being treated; such as brow lift, cheek or jowl lift or even neck lift. A full face thread lift requires approximately 18 barbed threads, although as not everyone will need a full face lift normally you would require about 2 for each brow, 3 for each cheek, 2 for each jaw line and 2 for each side of the neck. Once under the skin the threads are approximately 5 to 8 centimetres long, when cut to fit your facial contours. Suspension threads are inserted into the skin using a standard needle, but in order for them to sustain a lift they do need to be attached to the so called “anchoring point”. The anchoring points are stable points of the scalp or face, and they are different for the different areas of the face and body. Therefore, a detailed knowledge of the anatomy is essential in order to know which part would provide a good anchorage for the lift, and it is essential to avoid structures which are going to give way after a while or stretch and deform, therefore reducing the lifting effect. Hence, as far as a practitioner is concerned this is a more technically demanding procedure, requiring some basic surgical skill and knowledge of the anatomy. One treatment per area is usually all that is required to achieve the desired effect, often with immediate visible results, even more so after about 3 - 4 weeks. However, the results continue to improve over a 3 - 6 month period as your own collagen begins to grow around the threads aiding the lifting effect. 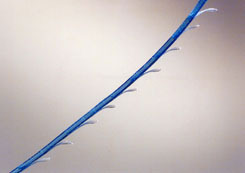 The effects of a thread lift using barbed threads are said to last up to five years. However it is noted by some experts that the results of the suspension lift are more dramatic than those of the free floating barbed threads, and that they are longer lasting. Whilst the free floating threads have been known to slip and not hold the lift as well, the suspension threads are said to hold the lift for much longer. In the case of non-resorbable sutures this could be for many years until the suture loses its strength. In the case of resorbable sutures usually, after the suture is resorbed into the skin the so called vector of pull is formed, which is really fibrotic (scar) tissue that maintains the lift long after the suture has been reabsorbed. How long will it take to recover from a Thread Lift? Post operatively there could be bruising and slight swelling, which usually settles in a few days. Recovery is generally quick, with most patients returning to work the next day or after a few days rest. You may find that your facial movement is limited for the first two weeks and it may hurt to laugh or smile. What are the risks and potential complications from Thread Lift surgery? Although not as invasive as other lifting procedures, the area treated will often be sore with some swelling or puffiness for a few days, with possibly bruising which will last about a week. An allergic reaction to the anaesthetic. A risk of small haematomas or seromas (collections of blood under the skin) occurring. Mild infection at the site of the thread insertion, although every precaution is taken to prevent this. In the case of barbed threads, the thread end may work its way out of the entrance to the skin; this is remedied by your doctor simply trimming the protruding end. Do not attempt to re-insert the thread yourself, as this may possibly result in an infection. Patients may develop a pucker, this can again be remedied by your doctor lightly massaging the area. Do not attempt to do this yourself. In a very small number of individuals, the threads do not work as satisfactorily or for as long as usual. Dislodging of the thread may occur (usually with free floating threads) resulting in a lopsided or crooked result (asymmetry). Although rare, as the threads are placed deep into the skin’s underlying tissue, it is occasionally possible for patients to either see or feel the barbed threads on the face, resulting in a telltale line (sometimes blue); in this case your doctor will remove and replace them. Scarring from the insertion of the needle is minimal but is nonetheless possible, particularly in patients with dark coloured skin, and all patients are advised to wear full sun block on their face to avoid direct sunlight exposure on the areas which may scar. Because with a thread lift there is no removal of redundant skin, as with a surgical facelift, there may be slight imperfections in the achieved results depending on your skin laxity; i.e. slight rippling or bunching of the skin post lift. This can settle with time and is usually hidden into the hairline, the neck or behind the ears by the practitioner, where it is not usually going to be noticed. What should you do after a Thread Lift operation? It is very important that you follow the advice of your surgeon carefully after a thread lift so as not to disrupt the placement of the threads. You can resume normal activities (light walking, sitting up, watching television, using a computer, etc.) within the hour but you should take it easy during the first few days. You should not talk, laugh or smile excessively or make exaggerated facial movements for the first few days. You should not sleep on your face for the first week. You should not shave your face, use chemical peels, scrub it or use harsh cleansers for the first week. You should avoid any strenuous exercise or sexual activities for the first week. You should not massage, rub or apply pressure to your face for one month as this could disturb the threads. You should use recommended painkillers as required. Contact your surgeon immediately if you notice any signs of infection or if you experience bleeding or a sudden increase in pain. Who should not have a Thread Lift operation? Most people can have this procedure as long as they are generally in good health. It is also vital that you are realistic about what you expect from a thread lift. In cases of serious loss in the elasticity of the skin a traditional mid-face, face or brow lift operation may be recommended in order to achieve a better result than that possible with the use of threads. If you are prone to keloid (red, angry, raised) scars, or have a history of problems with wound healing your surgeon may not recommend this procedure or may caution you that scars could be raised and very visible. Who can perform a Thread Lift? Only fully trained and qualified doctors and surgeons should perform more invasive thread lift procedures. More recent innovations such as PDO thread lifts can also be performed by trained nurses. Is Thread Lift available on the NHS? It is highly unlikely that anyone considering a thread lift would be able to access this free of charge on the National Health Service. However we would always recommend that you visit your General Practitioner before embarking upon a cosmetic procedure involving surgery. As well as their advice and guidance they may also be able to refer you to a local surgeon for a consultation. What is the average cost of Thread Lift? Private prices for a thread lift vary depending on the area(s) being treated and can start from approximately £1,500 for one area. Facial Lifting with threads is a quick, minimally invasive option for those people where gravity has started to take hold of their face and the skin has started to sag; but who as yet are not good candidates for a surgical facelift, which removes large areas of excessive skin, fat and tissue. Using a needle and either barbed or smooth sutures your clinician can tighten and lift the skin on your cheeks, brows, jaw line and neck without the need to cut your skin. This procedure does not produce changes as drastic as the traditional facelift and is not permanent, lasting a few years; therefore, it is best suited to younger patients (generally 30 to 50 years old) who require only moderate facial rejuvenation. Results vary enormously depending upon both the patient and the skill of the individual surgeon, so outcomes for cosmetic surgery procedures will always be more variable than those for less invasive non-surgical treatments. 58 year old female, before and after thread lift procedure. After photos taken 9 weeks post treatment. 55 year old female, before and after thread lift procedure. After photos taken 10 weeks post treatment. Photographs and case studies courtesy of Dr Lucy Glancey at Glancey Medical Associates. Both procedures above were performed using Spring Threads from 1st SurgiConcept; (bi-directional, smooth cogged, non-resorbable threads with controlled elasticity). (All before and after photographs featured are real patients treated by highly experienced practitioners, your results may differ). Click for ALL Thread Lift clinics in the UK & Ireland registered and verified by Consulting Room. 2 out of 5 based on 4 customer reviews.